JNN 13 Jan 2015 SOUTHFIELD (Michigan): Vehicles that drive themselves on the freeway or take over in traffic jams may be on the road in large numbers by 2017 and autonomous cars might create a $42 billion market for the technology by 2025, Boston Consulting Group said. Self-driving cars, building on technology already available in many luxury vehicles, will be able to navigate crowded city streets by 2022 and may be a quarter of worldwide auto sales by 2035, the firm said, citing interviews with industry executives and consumer surveys. Japan and Western Europe will probably adopt the technology most quickly, its study found. `Many people don`t realise how far along some of these technologies are,` said Xavier Mosquet, North America leader of the Boston-based firm`s automotive practice and managing director of its Detroit office. `Even more surprising, consumer interest and the production costs will make autonomous vehicles highly attractive to both carmakers and their customers. With as many as 9bn people predicted to live in urban areas within the next 25 years, more than the global population now, automakers are under pressure to create technologies that ease gridlock and give motorists stuck in traffic the ability to multitask safely. Ford Motor CEO Marl< Fields said this week at the consumer electronics show in Las Vegas that an automaker probably will introduce a self-driving vehicle within half a decade, but it won`t be his company, which is focusing on less expensive features thatassist in driving. General Motors said in September it will introduce hands-free highway driving technology on a Cadillac in two years. The F 015 Mercedes self-driving concept car, also shown this week in Las Vegas, has four seats, including the driver`s, that can face each other, rather than the road. Six screens let passengers monitor information about the Daimler vehicle and the outside world, using technology that responds to eye movements and gestures. Mercedes already sells a system that can pilot a car on the freeway, as long as the driver keeps a hand on the steering wheel, and by 2016 will have a hands-free system, Boston Consulting said in the study. Tesla Motors Inc plans to offer hands-free highway driving in Model S electric cars this year. The price to add the technology to vehicles will range from $2,000 to $10,000 and will decline in a range from 4 per cent to 10pc in the first 10 years as adoption spreads, according to the study. By 2035, about 18 million vehicles may be partially autonomous and 12m could be full autonomous, which China the largest market by that time. 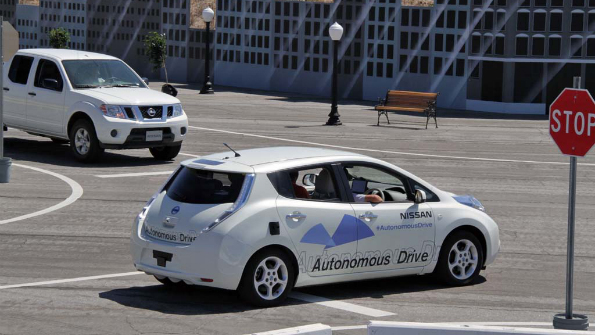 In a September survey of 1,500 US drivers, more than half of respondents said they were lil(ely or very lil(ely to buy a partially self-driving car within about five years, with 44pc saying they probably would buy a fully autonomous car in a decade, Boston Consulting said. This entry was posted in America, United States and tagged autonomous vehicles, Boston Consulting, Boston Consulting Group, Driverless Car, driving technology, Technology. Bookmark the permalink.